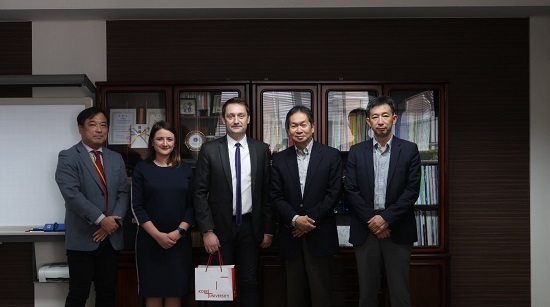 Following the Erasmus+ Staff Mobility Programme Agreement between Kobe University and Vilnius Gediminas Technical University (VGTU), Dr. Artūras Serackis (Professor, Faculty of Electronics/Department of Electronic Systems) visited Kobe University (KU) from 29 October to 2 November 2018. VGTU was founded in 1956 and is one of the biggest research universities in Lithuania. The beginning of the academic cooperation between VGTU and Kobe University dates back to the 1990s, and since then the two institutions have enjoyed fruitful research exchange. In March 2014, Kobe University’s Graduate School of Human Development and Environment and Graduate School of Engineering respectively concluded Inter-faculty Agreements of Academic Exchange with the Faculty of Fundamental Sciences, VGTU. Agreements on student exchange were also concluded in February 2016. Additionally, the Graduate School of System Informatics, as well as the Graduate School of Human Development and Environment and Graduate School of Engineering, concluded an Erasmus+ agreement with VGTU in December, 2015. During his stay in Kobe, Dr. Serackis gave four lectures to students at the Faculty and Graduate School of Engineering: Fundamentals of the Video Signal, Frequency Characteristics of the Video Signal, Digital Video Signal, and Video Coding. He also visited the following faculty members to discuss exchange activities between KU and VGTU, the characteristics of classes at each institution and possibilities for cooperative programs using the internet: Professor Akio Tomiyama, Dean of the Graduate School of Engineering; Professor Seiichi Ozawa at the Department of Electrical and Electronic Engineering; and Assistant Professor Hirotaka Suzuki at the Department of Architecture. Erasmus+ is a European Union educational funding programme that promotes exchange of students, teaching staff and administrative staff between universities. In the last two years one faculty member from each university has visited the partner university each year, one student from VGTU visited KU in 2017 and a student from KU visited VGTU in 2018. The two institutions are expected to send and receive more faculty members and students under this programme from next year onward.